How can improved regional climate simulations for Africa help decision makers? We know that climate change impacts are expected to vary depending on geographic location. In Kenya, where I live, the rainfall increase suggested by most models is anticipated to degrade water quality in coastal counties. Whilst in some inland regions, current cropland is expected to become increasingly suitable for cultivation. At the local level, farmers report that they continue to rely on indigenous knowledge because climate information is too general to inform their decisions on when or where to irrigate. To make robust decisions, farmers need accurate and timely information, specific to their spatial scales of operation. Typically this hasn’t been available due to barriers including a lack of tailored climate information at the right spatial and time scales, and poor or no advisory services. Listening to discussions during the African Hydromet Forum (September 2017), it was evident that there is demand for customised climate services to build resilience in African communities and economies. This demand is driven by practical considerations particularly when related to systems vulnerable to climate change. For example, when water related infrastructure has to be refurbished and thereafter serve for many decades without being sure what the future climate will be. It is evident that most decisions are made without climate science and that the current information is not considered in decision contexts. This has prompted a call for the climate research community to provide ‘usable science’. Climate models the primary tools used to estimate how climate might change in future are able to mimic some of the atmosphere and ocean’s physical processes and the internal feedbacks within the climate system. (Read more on How to understand and interpret global climate models). They can simulate broad observed features of climate at larger spatial scales (continental and above). Climate model estimates are more accurate for some climate variables (e.g. temperature) than others. Rainfall, one of the most important variables to assess in a changing climate, is not adequately simulated in present climate models. For Africa, when looking at the range of available climate models, they largely disagree in the direction of projected changes (i.e. is it getting wetter or drier?). Reliability of model estimates also reduces from larger to smaller scales as their ability to accurately represent local climate influences decreases. This is partly due to the inability of models to explicitly simulate key small-scale processes like thunderstorms and effects of orography such as mountain ranges or lakes, on local climate variations. As a result we are unsure if there will be more or less rainfall in East Africa, or Nairobi. As part of the Future Climate for Africa (FCFA) programme, researchers in the IMPALA consortium are pioneering a Pan-African, high-resolution (4.5 km) convection-permitting (CP) regional climate simulation: CP4-A. CP scale simulations have significant improvements in representing small-scale processes than coarse resolution simulations that are often not able to capture these processes. Higher resolution (finer scale) simulations improve representation of dynamics such as the influence of mountains, and statistical properties of convection and heavy rainfall, thus creating a radical improvement in their ability to represent convection and local storms in future projections. While the CP4-A simulations are based on single simulation from one climate model (single realization), they are expected to bridge some of the gaps in understanding the dynamics of various critical regional and local-scale processes that influence water cycles in Africa. These include improvement in representation of the Lake Victoria circulation system, which has been linked to the deaths of between 3,000 and 5,000 fishermen every year due to intense night-time thunderstorms. Such high-resolution simulations will eventually help in generating more accurate information on the timing and severity of storms. Providing better data on local scale processes will empower decision-makers to help reduce risks and protect the livelihoods of the most vulnerable. Improving our understanding of climate system processes so that we can better simulate them in climate models is part of FCFA’s goals. Better representation of local-scale features in climate models is a very useful step. However, no matter how detailed the results from climate models are, there will still be a range of underlying uncertainty. Recognising uncertainties and figuring out how to manage risks optimally should continue to be our approach to effective and appropriate decision making. This blog is the first in a series, looking at advances in CP4-A simulations and its applications for regional and local scale climate processes. Future blogs will also explore the implications of these improvements for improved climate services and development and disaster risk reduction applications. To stay abreast of these and other FCFA outputs, sign up to our newsletter and follow us on Twitter. 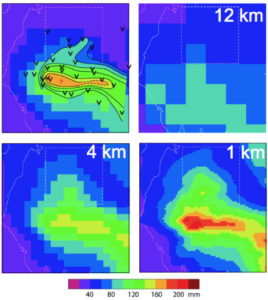 G. Fosser, S. Khodayar, P. Berg (2015): Benefit of convection permitting climate model simulations in the representation of convective precipitation. Clim Dyn 44:45–60. Liu, C., and Co-authors (2017): Continental‐scale convection – permitting modeling of the current and future climate of North America. Clim Dyn (2017) 49:71–95. Prein, A. F., and Co-authors (2015): A review on regional convection-permitting climate modeling: Demonstrations, prospects, and challenges. Rev. Geophys., 53, 323–361, doi:10.1002/2014RG000475. Inclusion of information that CP4-A simulations are based on a single ensemble (one realization). Clarification that the reference to “improvements in simulating localised process” via IMPALA work are attributed to simulations at convection-permitting resolution and NOT model improvements. Title amended to remove the impression that the “improvements” referred to are as a result of general model improvements.